Newbiggin RNLI lifeboat crew in action. Picture by RNLI/Newbiggin. Lifeboat volunteers from the Newbiggin lifeboat station have had a busy period of rescue call outs which began early on Thursday afternoon. The first call came in from the Coastguard Operation Centre at Humber following a request for assistance from a Newbiggin fishing boat. The lifeboat was launched and located the stricken vessel in the Cambois Bay. A tow was set up and the boat was towed back to Newbiggin. 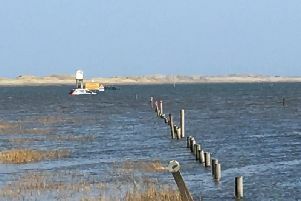 During the operation, two people on board a pleasure angling boat could be seen signalling for assistance and so the lifeboat was relaunched to head south back into the Cambois Bay area. The boat had broken down and needed a tow back to their River Wansbeck mooring. A tow was secured and a slow passage was made into the Wansbeck estuary. With the casualty safely secured the lifeboat returned to station and was made ready for service. Then at around 5.15pm, a call came in from another broken-down boat. It had suffered engine failure and was drifting towards the rocky foreshore in a freshening south-east wind, with choppy sea conditions. Thankfully, a contractor dive vessel Neptune, from Commercial Rib Charter, with crew which included a former RNLI-trained crew member Chris Johnson from Cullercoats lifeboat, spotted the danger and quickly secured a tow to hold the boat off the rocks until the lifeboat arrived. Shortly afterwards, the lifeboat took over the tow and headed south to the Blyth harbour. The stranded boat with four people on board was towed into Blyth and onto the visitors' berth. Blyth Coastguard Rescue team took over at the harbour, giving assistance and offering safety advice to the vessel's crew. The fourth and final call in the busy 24-hour period came just after 4am yesterday (Friday) following reports of a missing person. The Coastguard Operation Centre at Humber had received a call about a missing person who could have been in the sea in the Sandy Bay area. Lifeboat crews from Newbiggin and Blyth lifeboat stations launched, while the Newbiggin and Blyth Coastguard Rescue teams began a shore search. The missing person was located by the Northumbria Police search team and the incident was closed.